Omaeda also came to me on JP in my hopes for HW Orihime but VD Yoruichi came instead to save me from him. True, thanks for the suggestion. I also picked up most of the filler characters so I'm good on technique. Everyone was saying go with Ulq, but he looks boring and non cannon to me. I chose Barry. I wanted Aizen and Shinji, but I am satisfied. Forget which ones I got other than the one I chose which is Christmas Rukia which I did not have. I don't want any of them and I need help. Pick the one you dislike the least. Tag Teams are generally good because of the killer attributes. Oh. Droplet Trials are a godsend. Hey guys, returned to the game just for the 3rd anniversary! I went for technique and had to choose between: DR Ulquiorra, Shinji, Tensa Zangetsu, Ikkaku and TT Shunshui. Got DR Ulquiorra just for the link, but I was really tempted to get Zangetsu. I went with TT Izuru since his stats were the better ones. My first step up gave me a TLA Shinji Dupe and a Speed Haribel. Second step gave me nothing. My Free Ichigo Pull gave me Tensa Zangetsu. Man I would have gone with Parasol Szayel just because he's a seasonal but I understand why you went with Barragan. So many great Tech characters! First Shield character with Frenzy, congrats! I would suggest TT Renji or Kira but ultimately Kira since KLab usually doesn't put DR characters in summon selections all that frequently. Sorry about your 6* selection but congrats on the Anniversary Ulquiorra and Rangiku! Yeah I also hope Round 2 isn't appealing so that I can continue to save my orbs. Wow was that 3 5* in the free multi, that's amazing! Got White Zangetsu with my 3rd Pull, Got Isshin on my 4th, Got nothing on my 5th and Two Ulquiorras on my 6th pull. I think I made out pretty good for just spending a little over 1K. Got 4K left and it's all going the Manga characters. These are amazing pulls especially if they’re all new to you, congrats! 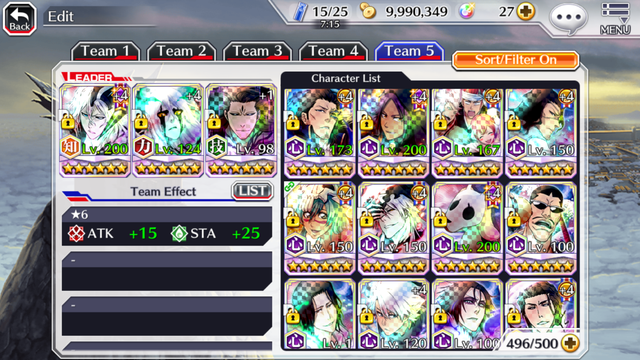 Since I still had orbs, I did a few more multi-pulls hoping for Anniversary Ulquiorra. I didn't get him, but I did get three new characters, those being TLA Rukia, and TEQ Hiyori and Rangiku. I also got a dupe PWR Barragan (eww) and Mayuri (yay, another dmaage reduction link!). I really will call it here, as I have pretty much everyone on the featured list, aside from Kaname, Isshin, and Shinji. While I would still like the Ulquiorra, I'll save my orbs for TYBW Vol. 4, which I hope is round two. I'm still at 13k, and I have A LOT of characters to max for orbs. That, combined with the co-op orbs resetting should mean I can get back up to at least 14.5k, maybe more. Here's hoping I don't need that much for TYBW Vol. 4, but you can never be too safe. Here's some evidence that Yhwach (and possibly TYBW Vol. 4) will be part of round two. I’m gonna try for ulq when it’s greater than a .5% chance of getting him haha. So tybw 4 might be yhwach, kisuke, aizen, and yoruichi? Looks about right. If they replace Yoruichi with another Ichigo (sorry hypno, but I don't want that), I'm going to flip a table. It would be interesting to see how they adapt God of Thunder. So tybw 4 might be yhwach, kisuke, aizen, and yoruichi? I'd take Mayuri over Aizen, honestly, but, yeah, that seems about right. God of Thunder can go either way, true to the skimpiness in the manga or a bodysuit under the lightning bikini. As a second question, is there any better way to get golden chappies? Or is it still the accessory tickets? Haven't played the game in a long time, and see there's been a ton of changes! Tickets are still the best way. Try to farm the new events for 3rd anniversary tickets. That’s how I got my golden chappy last year. Having TYBW Pt. 4 on the back end of the anniversary is going to be rough on the old orbs, in many ways. Christmas Rukia + TYBW Rukia allowed me to cheese boss rush. Probably used all my luck here and won't get nothing on the next TYBW, but whatever, I'm happy. Your luck is on fire, congrats! Yeah, for sure. Stop and save some of that luck for round two! I got a purple gold chappy, yey. Who's my best option to use with it, Halloween Yoruichi? 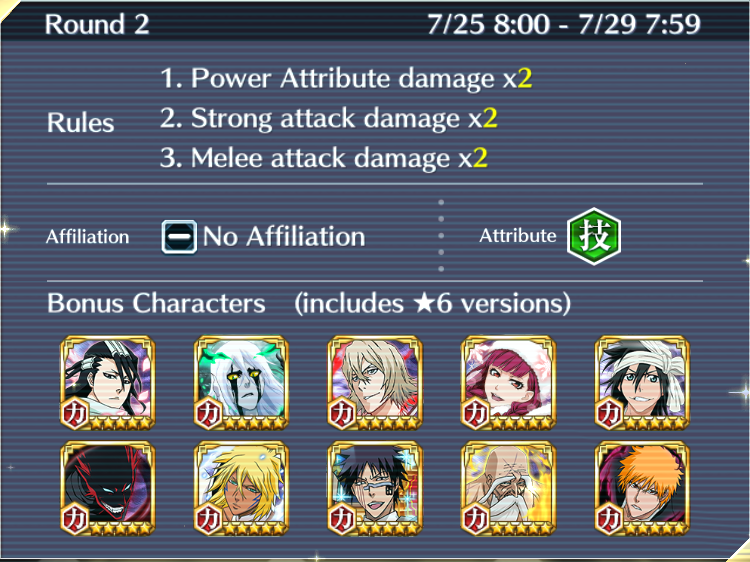 All these boosts makes TT Ichigo's vortex too strong so I ended up using TYBW Renji to clear, Frenzy Byakuya for vortex + bonus, and Kukaku for bonus. 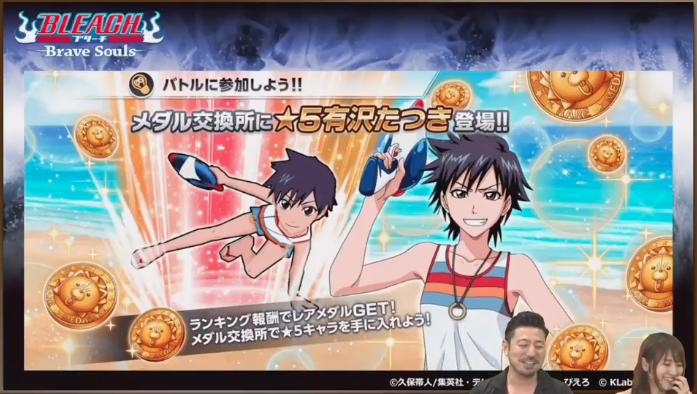 Japanese KLab Games Station revealed that Tatsuki is the new Medal Exchange character for the end of the month. I always wanted Tatsuki, but I was expecting the school uniform or karate gi. Is it known yet what kind of link she is? Not yet but maybe she'll be NAD? We've been getting a lot of that soul trait for the recent Medal Exchange. Hopefully they give us more info on tonight's english KGS! Anyone with more than one account, how do you play that account? Do you use the same device or a separate device? I have a JP and a Global account, you need separate phones to play more than one account with Brave Souls. How does the shield/barrier skill works? Does it stack? If I receive +1 from a Christmas Rukia and in a short period of time receive +1 from anniversary Ulquiorra, I'll have +2 or one will remove the other? Or if I'm the caster and have +3 and other character use it too, it'll go to +4 or reset to +1? 4 in 1, that’s an amazing pull! Was this Step 7? Almost makes me want to pull! Yea. I have so many revival candles now. I had a bunch of 5 star raid characters that I hadn’t leveled so grinded tons of orbs and ended up lucky. Not sure if it was worth but I wanted a character with boost so I kept grinding til I got what I wanted. I did 2x multi-pulls this morning for Ulquiorra. I know I shouldn't have, since I had all but three of the featured characters, but damn it I want him! I didn't succeed, only getting a Hiyori. Oh well, at least it's another SAD link. I'll probably wait to see if news of round two is released before this banner ends. If it's not TYBW Vol. 4 I might do a couple more multi-pull. I'm hovering around 14k orbs still which is good, but I really have no idea how much I'll need so I want to be careful not to over-spend. I'm easily willing to spend all 14k for a TYBW Yoruichi, I don't even care if she's one of the "shafted" ones. I need her that much. All my pulls this year have been terrible. :< Just like last year. For my attribute I chose tech and got the choices of: Soi-Fon (Already have), TT Shunsei (already have), Shuhei, Butterfly-Aizen, and TT Rukia. I already have good characters for all the attributes, so it didn't matter to much on what I picked, but it was still kind of disappointing. :( Went with TT Rukia because I've been wanting a Rukia for ages. As for the summons..... Golden Ray of Despair. :,) I'm not going to bother anymore. I can respect that. Rukia is <3. Aren't you guys afraid that TYBW Yoruichi is going to be the same as TYBW Rukia and the thunder cat form will just be part of the special cutscene? I still can't believe that bankai Rukia isn't a playable form after they made the Kenpachi one. I don't really know how you'd make her Bankai playable. It's fragile in universe, so it being a one hit kill/cutscene works for me. It's one of the few Bankai I don't have a problem with being a cutscene, like Sui Feng's.